When seeking a career that’s never dull in mental stimulation or new information, what better field than library science? That’s been the strategy for Brenda Pfannenstiel, who has worked in the public, academic, special and medical library sectors. In school she was interested in so many things that going to library school was her way of not choosing which subject she would specialize in. “The library was always full of possibilities,” she said. Now serving as Manager of Library Services for Children’s Mercy Kansas City, Brenda handles collection development and license management on top of information literacy and skills education, developing LibGuides, participating in hospital-wide workgroups, and more. You just celebrated your 18th year with Children’s Mercy Hospitals & Clinics (congratulations!). How have you seen the role of the library change throughout your tenure? The role of the library has changed from a bricks-and- mortar shrine housing collections of knowledge to an access point (physical or virtual) that hosts even larger—but not necessarily tangible—collections. The role of the librarian is essentially the same, helping people to navigate the information sources to find the best available answer to their information need. How we fulfill our role has changed radically, but the core of our role itself remains. As Manager of Library Services, what are your daily and top priorities? Our system of hospitals, urgent care and specialty clinics has nearly tripled in size over the past decade, but our library staff remains small. So in addition to collection development and license management, I still do quite a bit of expert literature searching, information literacy and search skills education, and occasional pinch-hitting with technical matters, etc. I enjoy teaching and developing LibGuides and other information materials, and I have the opportunity to participate in many hospital-wide interdisciplinary committees and work groups. Are there any special considerations when serving health care professionals in the pediatric field versus those that treat older patients? When we do a literature search, especially for clinical care, the age of the patient is important. The differences among patients who are 2 days old, 2 years old, or 12 years old are vast, compared to the differences among patients who are 20, 40, or 60. Even in consumer health, when we provide information to a patient we must consider the child’s age and development, but more often we are providing the information to a parent or caregiver rather than to the patient directly. Pediatrics is generally more collegial and interdisciplinary than other specialties, and is more focused on anticipatory guidance (preventive care through advising and educating the parents) and on advocacy. It is rewarding to see the development of younger librarians who are able to take for granted opportunities that were rare for librarians, and for women, forty years ago. I have had the privilege to work with some very smart, ambitious, and capable young librarians who are building amazing careers. I have also enjoyed seeing my own work reflected in changes in practice or in published research, even when my name wasn’t on it. My younger colleagues will be credited for their contributions to systematic reviews and other publications. Budgetary pressures coupled with the sometimes staggering price increases of medical and scientific publications, along with rapid technological changes have been challenging at times. When I went to library school at the University of Chicago, I do not recall any classes in political skills, conducting ROI analyses, or navigating the choppy waters of large organizations. And yet, my colleagues in hospital libraries across the country have had to acquire those skills. Many of us are introverts for whom those skills did not come naturally, but we are all naturally life-long learners so we cope. What differences do you see in how health care professionals approach research; whether it’s how they access information, their interaction with the library, use of technology, etc. Our Library Services department supports education and research throughout our organization, and we must adapt our methods to the technophobe and the digital native alike. They all seem to appreciate the personal touch with individual, face-to- face communication but many are also comfortable with virtual assistance using new technology. Even the technophobe can learn to appreciate having information delivered to his desktop in minutes, and even the digital native sometimes likes to print out articles to read and annotate on paper. Because so many of our end-users are in other buildings or at a remote location, we sometimes visit them in person to remind them that they can reach out to us through our Virtual Library. Collection development decisions are complex. We remove a print title based on usage, space, and whether the title is still available in a resource library. We add print only when it is a core resource for our “zombie apocalypse” shelf (emergency management should the Internet be inaccessible for an extended period) or when it is needed but not available on an institutional license. We add or remove electronic resources based on usage, cost-per- use, relevance to our scope of collection vs. availability at university libraries, and perhaps on how onerous the chore of working with the license agreement or the electronic platform is. How do you stay up-to- date on what’s happening in information services? 1) Medical research librarians will have an advantage if they have a second science or technical degree, and librarians who want to rise into management positions should seek opportunities to develop organizational leadership and political skills. 2) No matter how “virtual” our services get, our relationships with our end-users are personal and they will latch on to us (forgive the pediatric allusion) if we give them the information they need at the time they desperately need it. 3) It isn’t enough to give great service and provide great resources, you must be seen by your organization leaders to be doing all that. Stay visible, especially before the budget decisions are made! 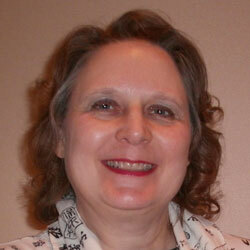 Brenda began as a children’s services librarian, then an adult fiction librarian, a newspaper cataloguer for the U.S. Newspaper Project at a couple of historical societies, and then as a clinical medical librarian at the UMKC School of Medicine (where the first clinical medical librarian program began, nearly 50 years ago). She really enjoyed working closely with the medical teams. In her personal life, Brenda likes to read and is a quilt-maker, actively participating in a quilt guild that meets at night for quilters who work. She likes gardening in theory, but would like it more in reality if not for the ragweed, oak mites, etc.